John Payne Todd’s bedchamber is interpreted as though he has just stepped out. The bed is askew, clothes are seen piled on the floor, a glass of wine is placed next to the letter he is writing. Small details like these in conjunction with textiles, furniture, and objects are what bring an interpreted room alive. The challenge then is to create a welcoming space for guests to live that story. Unlike a private bedroom, an interpreted room requires space for guests touring through. Great planning goes into where objects and furniture are placed in a room like John Payne Todd’s bedchamber. As stewards of Montpelier, the Curatorial and Collections Department works to protect the Montpelier Collection, including objects on display in the Mansion. One way we do that is with the help of stanchions. Stanchions help guide visitors through a room, allowing guests to be in the space, while also keeping the objects at a safe distance. When an object is touched or bumped, there is the potential for damage. By keeping the objects and our visitors separated by stanchions, we can offer a better experience than if guests could only peek into a room. In addition to stanchions, the Education and Visitor Engagement Staff at Montpelier is an essential component to safeguarding the collection objects on display. By working together to communicate daily, our two departments are able to mediate any incidents that could cause harm to the Montpelier Collection. The Madisons lived full-time at Montpelier during James’ retirement period. The house would have been alive with guests, servants and of course, the Madisons. Payne Todd’s bedchamber is interpreted as though he has momentarily left the room- the bed is rumpled, there are empty wine bottles left about and clothes are piled on the floor. Props such as reproduction wine bottles help to create the lived-in feel the room would have, had Payne Todd resided there. Reproductions like these are made by studying an original object or researching the time period through documentary evidence. The reproduction wine bottles were modeled from an original Madison wine bottle found by the Archaeology Department. A Madison wine bottle seal (L); a late 18th century Madison wine bottle MF2014.36.1 (C); a reproduction Madison wine bottle (R). Both the seal and bottle were found at Montpelier by the Archaeology Department. Reproduction clothing is strewn around the room to illustrate Payne Todd’s presence. Since he was noted holing up in his room for days on end, this dishevelment would be appropriate. The garments used almost make up one full outfit: a shirt, fall front trousers, and a coat. Together with a waistcoat (vest) and other accessories, the garment would have pulled together to look like the illustrated fashion plates of the time. The clothes are sized to fit Payne Todd’s measurements as given in his passport. 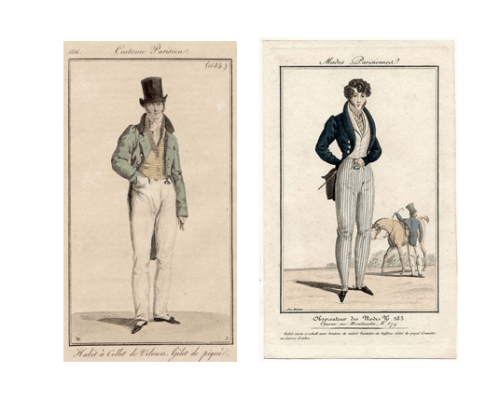 Fashion plates, “Costume Parisienne,” 1816, and “Modes Parisiennes,” 1820. Handwritten letters and notes are scattered about the table and chest of drawers, representing Payne Todd’s many correspondences. While Payne burned much of his writings, as was common during the period, references are made to him corresponding through letters. Rather than locking up or filing all of his mail, however, he apparently left at least some out on his table. Christopher Hughes wrote to Dolley in mortification after seeing a letter he had written to her sitting on Payne’s table; not only did he spot it, he also thoroughly reread the letter and asked for it to be destroyed. The letter was six years old when Hughes saw it out on the table. A reproduction letter on the Madison provenance drop-leaf table and a pair of reproduction notes. A lot of research, planning, time, and teamwork goes into each furnished room you see at Montpelier. From Research to Curatorial & Collections, to the tours lead by Education & Visitor Engagement, each room is completed through strong partnership across departments. [Christopher Hughes] to Dolley Payne Todd Madison, November 27, 1833, box 1, Papers of Dolley Madison, Special Collections, University of Virginia Library, Charlottesville, Virginia, MRD-S 26807. Leanna joined the Curatorial & Collections Department at Montpelier in 2018 as a Museum Technician where she provides preventative care for the Montpelier Collection. This article was written with research done by former Curator Teresa Teixeira.